The 'M' word isn't mentioned, but doesn't this follow a relatively recent pattern involving them reported elsewhere in Europe? A man who carried out a stabbing and arson attack on a Swiss train has died along with one of his victims who was doused in a flammable liquid. 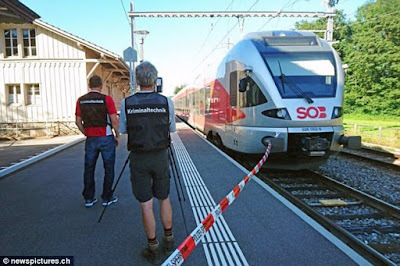 Swiss police confirmed that the man, 27 and the woman, 34 succumbed to their injuries after the incident in a train carriage in the eastern canton of Saint Gallen yesterday. The attack came as the man set a train carriage on fire and stabbed at passengers, including a six-year-old child, leaving four people in hospital. Police say the suspect, who has now died after setting himself on fire, was a 27-year-old Swiss national who was not of immigrant origin and did not have a criminal record.